That's where we find K (Ryan Gosling), a newer model replicant designed to hunt down his own kind. But, much like the original film, all is not what it seems and K is brought into a mystery that once again prompts the audience to evaluate the meaning of life, human souls, and love. 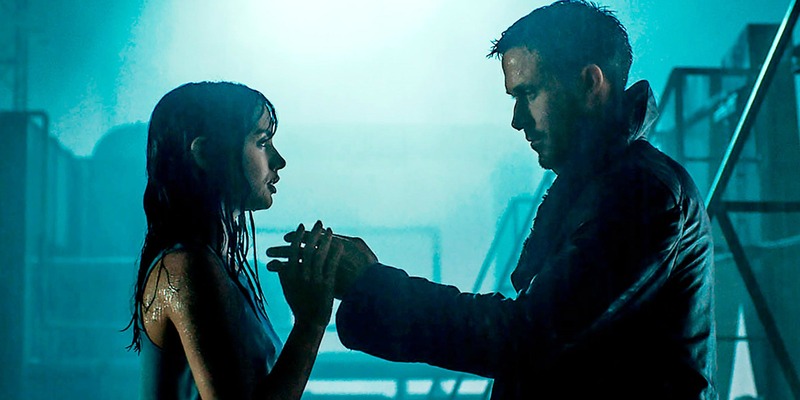 Blade Runner 2049 is in essence a move that is the same and yet strikingly different from its predecessor. It pulls at the same threads and hits the same plot points, but does it so differently that it never feels like the same movie (for better or for worse). It has updated its dystopian future to reflect our current fears and dreads about the future. Many of these are the same (corporate control, overcrowding, pollution, AI), but many of which are different (pornification, social engagement in the age of the Internet, bioengenering). If Villeneuve's style feels too cinematic the performances he pulls from his actors are the exact opposite. I've already spoken of Ford, but Gosling's K is one of the best performances of the year. His slowly unraveling character, coming to grips with his own soul as the film unfolds, is performed with subtle complexity by Gosling. A moment of emotion in the film from K is powerfully shocking thanks to Gosling's simmering performance. Robin Wright, as K's commander, teases at ideas about sexuality and humanity within her exposition, and Sylvia Hoeks performance as the replicant Luv is horrifically evil and yet nuanced. Blade Runner 2049 is a fantastic movie with bold ideas, visually stunning direction, and powerful performances. But underneath it all lies a Hollywood reboot, and that made it less than for me. Let's trot out all the classics and tie up some things here and there so we can make a few more of these seemed to be an underlying motivation. No, the big question of the original Blade Runner is never firmly answered, but it's addressed more openly than ever. There is a lot of good about this movie for sure, but it isn't the artistic and defining masterpiece that the original was. That is, obviously, a very high standard to hold something to, but it's the standard that it set itself up for. Blade Runner 2049 doesn't have the grit and honesty that the original had, eschewing noir aesthetics for perfectly framed set pieces. It is that edge that the movie lacks, and what kept nagging me as I viewed it.